The bold bob from the Spring-Summer 2019 collection: a short cut radiating femininity. This Spring-Summer 2019, Jean Louis David has restyled the famous bold cut with a bob inspired by the seventies, fully enhanced by an intense, radiant brown shade. Still highly on-trend, the bold cut is constantly being reinvented, season in season out. Its meticulously structural blunt lines have inspired Jean Louis David to create a short bob with a resolutely feminine retro look. 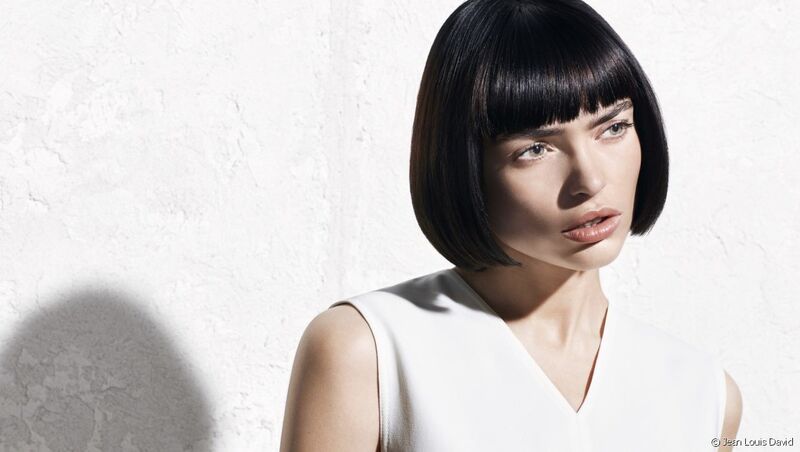 The timeless traditional bob haircut is getting an ultra-bold and minimalist look this season. Cut to chin length, the hair frames the face, adding character. To finish it off, a retro inspired thick fringe highlights the eyes. The two cut lines accentuate the impression of volume, for a bob that radiates femininity. Jean Louis David's exclusive Sunlight technique adds depth and complexity to this Spring-Summer 2019 short bob, allowing dark hair to be slightly lightened. Here, auburn highlights are applied to the lower sections of hair for an extremely natural sun-kissed look, revealing a maximum level of intensity only when the light hits them. The sophisticated style: the short bold bob takes on a highly sophisticated look here, created by ultra-sleek blow-drying coupled with Jean Louis David's Brush Cream. To add even more character, the tips are curved inwards to structure the whole hairstyle. The rocker chick look: extremely versatile, this short bob can be transformed into a rock 'n roll bob by creating a quiff from the fringe. 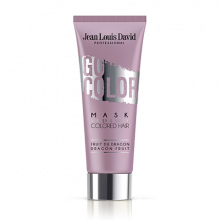 The lengths are slicked back behind the ears using Jean Louis David's Shine Wax for an on-trend edgy hairstyle. Finally, a side parting brings out the ultra-bold side to the haircut. The glamourous look: XXL curls and extravagant volume transform this bold bob into a highly seductive Hollywood haircut. Created using curling tongs, the big loose waves are then scrunched and held in place using Jean Louis David's Design Spray for a playful finish. The bedhead look: for this version, the hair is scrunched and the tips separated using Jean Louis David's Fix Spray. The result: a messy finish which perfectly imitates the highly on-trend bedhead look. Say goodbye to the blunt fringe and instead, wear it swept to one side to follow the movement of your locks and makes your eyes stand out.